George Heywood was a quality player who, had he chosen to, could have played at a much higher level than the one he chose to play at. In all, he played over 300 first teams games for Altrincham and was a true legend. Born in Clayton, the son of former Newcastle and Blackpool forward, Fred Heywood, George grew up in Salford and turned out for South Salford Lads' Club between 1921 and 1927. He picked up an England Schoolboy international cap against Wales in 1921. Spotted by the Welsh international Billy Meredith, he signed as an amateur for Manchester City, playing 11 Central League games at left-back, whilst also turning out for Oldham Athletic in the Midweek League but he settled at neither and rejoined South Salford Lads. George turned out for Altrincham at right-back during 1928/29 season, before finally signing for Altrincham in April 1930. He played the last four games of that season at left-back. For the 1930/31 season George started the season at left-back before reverting to right-back for the rest of the season, missing only two games all season. Now established at right back, George was a near ever-present at right-back during 1930/31 as the team steadily improved. His performances were now starting to attract scouts from League clubs, but George showed no interest. In 1932/33 he was firmly established, as an ever-present fixture at right-back, missing only three games all season. Quick, strong in the tackle, an accurate passer and with excellent positional sense, George turned down interest from Crystal Palace and Burnley. On joining Altrincham, George was fixed up with a job at GEC as a mechanical inspector, a job he held until retirement. 1933/34 saw success in the Cheshire Senior Cup as George led Altrincham to a 1-0 final victory over Congleton at Edgeley Park in front of 5,671 spectators. The team also moved up to 6th in the table. The season was also notable as George scored his first goal for the club, a penalty in a 5-1 win over Runcorn. 1934/35 saw George paired with former England and Spurs left-back Billy Felton and saw Altrincham, led by George, finish second to Wigan Athletic and reach the semi-finals of both the Cheshire Senior Cup and the Cheshire County Cup, with George adding two further goals to his total. 1935/36 witnessed George lining up, yet again, at right-back but, in December, George was finally persuaded to try his hand at the full-time game and £250 saw him join Port Vale, just short of his 29th birthday. Unfortunately his debut was in 9-2 drubbing at Nottingham Forest but, as expected, George slotted smoothly in at both right- and left-back and he played 23 games for Port Vale into the 1936/37 season. Relegated from the Second Division Port Vale experienced a change of management and, after two games of the following season, George was deemed surplus to requirements. So, an injury crisis at Southport, coupled with a recommendation from former Altrincham trainer, Jimmy Seddon, led to George joining Southport for £50 on 11th November 1936, where he made his debut three days later in a 1-1 draw, at home to Stockport County. In all, he made 14 league and 2 FA Cup appearances by the end of the 1936/37 season, when he was released. Having had a taste of League football, George returned to the non-League game and 1937/38 saw him playing with Hyde United before moving on to Northwich Victoria, after a brief spell at Stalybridge, where he stayed until the outbreak of the Second World War. When the war-time Cheshire County League commenced, George was found back at Moss Lane, turning out for his beloved Altrincham, possibly helped by the fact that George lived, a long goal kick away from the ground. George played through to the conclusion of the 1940 season and then retired. George sadly died of a heart attack whilst on holiday in Guernsey in September 1985. The table below shows, for each season, the number of appearances in each category, followed by the number of goals scored. Born: Miles Platting, Manchester, 4 October, 1939. Considered small for a centre forward, Bert Lister was however tenacious, hard working and a superb finisher. Growing up in Nelson Street, Miles Platting, Bert learned his early football skills with other local young lads on Thomas Street croft, and played for Corpus Christi football team. At the age of 13, Bert and his family moved to Blackley. He then went to Mount Carmel School, where he played alongside future Manchester United player and manager, Wilf McGuiness. Bert represented North Manchester Area Boys at the age of 13 and later took over, from Wilf McGuiness as captain. Bert’s Headmaster was Jimmy Mulligan, a former Irish International and Manchester City player, who recommended Bert to Manchester City. Bert signed up for City as an amateur in December 1954 and turned professional in November 1957, working his way through the junior ranks at Maine Road, before eventually spending six years at Maine Road but he played only twice for the first team, in 1958/59. After his time at City, Bert was signed, along with, Ken Brannagan by Oldham Athletic for a joint transfer fee of £10,000 in October 1960. Making his debut against York City, Bert scored and finished the season with sixteen league goals in 23 games, including hat tricks against Crystal Palace and Stockport County. In addition, he scored three goals in three FA Cup ties and a further two League Cup goals in his only appearance in that competition. Having established himself, Bert started the following 1961/62 season in mid-September, due to injury, but still played 32 league games, notching 17 goals and, in addition, he got 4 goals in 6 FA Cup ties. Once again, Bert scored two hat tricks; one in the FA Cup against Shildon and one in the League against Crystal Palace. 1962/63 was Bert’s most successful, as Oldham finished second in the table and gained promotion to the Third Division. Bert scored 32 league goals in 39 games with the highlight coming on a bitterly cold day Boxing Day, complete with snowstorm, on a white pitch, with blue lines, using an orange ball, when Oldham Athletic beat Southport 11-0, (Oldham's record win). Bert thrived in the conditions and scored six goals, (all right-foot shots). An amusing story is that Harry Massey, the Latics' Chairman, had offered the team a £5 per goal bonus prior to this match. He not surprisingly withdrew his offer for subsequent matches! Bert also scored 3 further goals in 2 League cup games and made a further appearance in the FA Cup. Playing Third Division football in 1963/64, Bert led the line, scoring 14 goals in 29 league games, in addition to 2 FA Cup goals in two matches and a further goal in his only League Cup tie. Bert’s last season, 1964/65, saw the goals dry up as he scored only twice in 12 league games plus a further goal in 2 FA Cup ties. Bert was then transferred to Rochdale for £2,500 in January 1965, scoring three times in 16 games before the end of the 1964/65 season. The following season he missed the start, once again due to injury, but still scored 11 league goals in 29 league matches and alsor scored twice in three FA Cup games, as well as once in three League Cup games and a further goal in one Lancashire Cup game. 1966/67, Bert’s last season at Spotland, witnessed him scoring twice in 11 League games and played 1 league cup. Bert’s final port of call was Stockport County, whom he joined in March 1967 and helped win Fourth Division Championship with 11 goals in 16 games, including a hat trick against Southend United. Bert surprisingly retired from professional football at the start of the following season, after just one minor match, to concentrate on running his newly purchased newspaper shop in Royton. But, a few months later, Altrincham manager, Fred Pye persuaded him to help out after cartilage surgery ruled out Johnny Worth for a period. With the FA Cup 1st Round tie against Grantham imminent, a signing was necessary but Stockport wanted £250 for Bert to play four games for Altrincham - something Bert didn’t agree with, as he had joined Stockport on a free transfer and hadn’t taken a signing on fee. This meant it cost Altrincham just over £60 a match just to play Bert and that was without wages! Incredibly Bert hadn’t trained since quitting Stockport but still made his debut on the 1st December 1967 in a 2-1 victory at Tranmere Rovers Reserves, in which he scored. He followed this up with a goal in the 3-0 FA Cup 1st Round win over Grantham and then went on to score in his third game, also away, and then in his fourth game, he scored on his home debut in a 4-1 win over Northwich Victoria. That was the four games up, however, Bert then missed the next two games through flu and the deal with Stockport was £500 at £50 pounds a game over the next 5 games. Bert more than paid for himself! In his next game he scored in the Second Rround 2-1 defeat at home to Barrow. This he followed up with a hat-trick in the 3-2 win against Ellesmere Port. Bert then missed the next 5 games but reappeared as a substitute in a 3-2 Cheshire Senior Cup defeat against Crewe and scored. He then went on to score 2 more, in a 4-1 win against Hyde United, and another hat-trick in a 4-0 win over Stockport Reserves. This meant that Bert had scored in each of his first nine games for Altrincham, scoring 15 goals in total, including 2 hat-tricks. Strangely, Bert was quiet for the next three matches before coming back with a brace in a 3-0 win at Wigan Athletic, this was followed by a further goal in his next match, a 5-2 drubbing of Runcorn. Failing to score against Stafford in his next match, Bert picked up an injury which meant he only reappeared at the end of the season, after missing 8 matches, but finished up adding one further goal in the NWFL final second leg, 2-1 defeat at Macclesfield. Bert finished the season with an incredible 20 goals in just 17 games. He stayed on for Altrincham’s inaugural season in the Northern Premier League, playing in the opening fixture but was injured and subbed at half time, thus missing the next two matches. On his return, against Hyde in the Northern Premier League Cup he was swiftly off the mark in the ninth minute before hobbling off after 35 minutes, causing him to miss the next four matches. His return was in a 4-3 defeat at Bangor City and, sure enough, Bert scored again. This was followed by both goals in a 2-0 win against Morecambe in his next game, a further goal against Wigan, two in the 3-4 defeat at South Shields, followed by a hat trick against the same opposition in the cup, making it 10 goals in 10 games. However, there followed a drought the next 8 games as Bert failed to get on the score sheet and he was eventually dropped for 4 games, only to return and score against his ‘favourite’ side South Shields in a 1-1 draw. Two goals in his next 6 matches saw Bert dropped to the bench and, eventually, out of the club. His final game for Altrincham being in the 2-3 Cheshire Senior Cup defeat by Northwich. Basically, Bert had been replaced by Don Weston. A brief spell at Stalybridge Celtic... and that was it. Later in life, Bert ran a post office in Collyhurst and later still drove a taxi in Blackpool. Oldham Athletic, 1960-1965. Appearances: League 135, FA Cup 14, League Cup 4. Goals: League 81, FA Cup 10, League Cup 6. Total 153 appearances, scoring 97 goals. (Bert would have had 100 goals but his hat-trick against Accrington Stanley was expunged from the records when that club folded). Rochdale, 1965-1967. Appearances: League 56, FA Cup 3, League Cup 4, Lancashire Cup 1. Goals: League 16, FA Cup 2, League Cup 1, Lancashire Cup 1. Total 64 appearances, scoring 20 goals. Paul Edwards (right) started as a junior with local side, Tranmere Rovers, after which he joined Marine FC, where he came through the youth team and ended up winning the supporters' Player of the Year award three times in four seasons. In his time there he appeared in two League Cup-finals at Maine Road, (one of them on the winning side), and was also in Marine's Liverpool Senior Cup winning side and contested the FA Trophy semi-final with Northwich Victoria in 83/84, (a season in which Marine played 78 games in all competitions!). After four relatively successful seasons with Marine, Paul then stepped up to Conference level and joined new Altrincham manager, John Williams at Altrincham in the 1986 close season. Primarily a defender, Paul made his debut at left back in the season’s opening fixture, a 1-1 home draw with Bath City. He played one more game at left back before being moved into midfield, to accommodate Peter Densmore at left back and spent most of the remainder of the season playing in a midfield role. The season wasn’t particularly impressive, (after Wembley the previous season) as Altrincham were rebuilding but they did make the final of the Cheshire Senior Cup, only to lose 3-0 to Runcorn. The following season Paul was selected regularly at left back and played in Crewe’s 3rd Round FA Cup tie with Chelsea, which Chelsea won after a replay. His performances impressed scouts from several league clubs, finally leading to Crewe Alexandra making him an offer to play in the Football League, at the relatively late age of 24. He signed in late January 1988 and made his debut on the left side of midfield in March in a 2-0 defeat at Scarborough, only being switched to left back towards the end of the season. In all, he played 9+ 2 Fourth Division games. For the 1988/89 season he was a near ever-present at left back as Crewe gained promotion to the Third Division, with Paul playing in 53 of a possible 57 league and cup games. 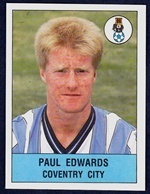 The following season was more of the same and Paul’s performances in the Third Division were attracting scouts from First and Second Division clubs which led to a £350,000 offer from First Division Coventry City, which was accepted in March 1990. He made his debut as a substitute in a 1-4 defeat at home to Sheffield Wednesday/ His full debut followed two weeks later in a 3-0 away defeat at Manchester United. For season 90/91 Paul was a regular pick at left back into January the following year but, with Coventry struggling and trying other players in his position, they eventually signed former England left back, Kenny Sansom and Paul wasn’t to see the first team again until the final game of the season, when he came on for Sansom in a 6-1 defeat at Arsenal. Although he started the following season in the first team, interest was shown from Second Division Wolverhampton Wanderers who signed Paul for £100,000 in August 1992 and he went to finish the season as a first team regular. For 93/94 he dropped out of the reckoning in terms of first team football but was transferred to West Bromwich Albion in January 1994 for £80,000 and played out the remainder of the season. The 95/96 season gave him only sporadic first team opportunities and he was eventually loaned out to Third Division Bury, where he played four games at left back. Unable to break back into the first team, and with age against him, Paul joined Conference side Hednesford for a short spell and then Paget Rangers, where he was eventually appointed joint manager in October 1999, only to leave in July 2000 due to extreme financial difficulties at the club. It was not a bad career for someone who only turned professional at the age of 24. It is believed that Paul still lives and works in the Birmingham area.